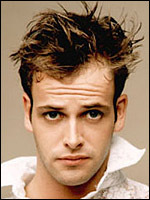 The charismatic and personable Jonny Lee Miller will always be associated with two things; his performance as the Sean Connery -obsessed bleached blonde Sick Boy in Trainspotting (d. Danny Boyle, 1996), and his brief marriage to Angelina Jolie . However, these should not obscure his other impressive achievements. He was born on the 15th November 1972 in Kingston-upon-Thames, the grandson of Bernard Lee , who played 'M' in the early James Bond films. After early work with the National Youth Music Theatre , he made his acting debut in the television adaptation of Mansfield Park (BBC, 1983), which he then followed with minor appearances in such long-running dramas as Keeping Up Appearances (BBC, 1990), Inspector Morse (Carlton, 1991) and Casualty (BBC, 1992). A recurring part as Jonathan Hewitt in EastEnders (BBC, 1993-4) led to his first significant leading role, in Iain Softley's teen action film Hackers (US, , 1995), where he met and married co-star Jolie. After his hilarious performance in Trainspotting (where he was the only non-Scottish leading actor, although this is barely noticeable), he pursued cerebral and highbrow projects, such as Alan Rudolph's Afterglow (US, 1997) and, more successfully, the role of the traumatised mute private Billy Prior in the First World War drama Regeneration (UK/Canada, d. Gillies Mackinnon, 1997). He reunited with his Trainspotting co-star Robert Carlyle for the patchy but entertaining highwayman romp Plunkett and Macleane (UK/Czech Republic, d. Jake Scott, 1999) playing the foppish aristocrat Macleane with vigour. He revisited Mansfield Park (d. Patricia Rozema, 1999), this time as the upright and gentle Edmund Bertram, and did the best job possible of playing the morally bankrupt journalist protagonist in the Iain Banks adaptation Complicity (d. Gavin Millar, 2000). He made several lesser films around this time, including the chaotic crime comedy Love, Honour and Obey (d. Dominic Anciano & Ray Burdis, 2000), and the misguided vampire film Dracula 2000 (US, 2000). More artistically respectable projects included his appearance in the reworking of Chaucer's The Pardoner's Tale (BBC, 2003) and his sensitive and nuanced portrayal of Byron in the BBC's drama about his life, Byron (2003). He also collaborated with Woody Allen on his dual plot comedy-drama Melinda & Melinda (US, 2004). Although panned by the critics, his knowingly tongue-in-cheek performance in the bizarre Aeon Flux (US, 2005) is at least a diverting send-up of the traditional Hollywood villain, and hints at the intriguing directions his career may yet take.